Building in the South West of Western Australia, or indeed anywhere in Australia, can be tricky at the best of times. With hot summers and cold winters, choosing the right insulation for your home is one of the most important things to do. Properly insulated houses are not only more comfortable all year round but depending on what materials you choose it can make a house both safer and more energy efficient. In this 2-part blog series we will be talking about two building products we have used with huge success to achieve sustainable, outstanding homes, SIPS and the MasterWall System. Structural Integrated Panels (SIPS) strong, pre-manufactured, highly insulated and high performance building components used to create floor panels, wall panels and roof panels. They’re specially engineered to fit tightly when assembled. A SIPs home or building is constructed by assembling the panels together. Essentially SIPS are made of 3 components. They contain two outer walls with a 90mm polystyrene core sandwiched between them. The interlocking mechanism of the panels creates an air tight structure that minimizes air leakages, resulting in a home that maintains a more constant temperature in any season. Building with SIPS also means no timber framing needs to be done which can dramatically shorten the build time of your house. Once assembled the panels can be clad or plaster boarded, but can also simply be painted to further save time. In a country like ours, there is always the threat of bush fires, especially in rural towns and areas. It is in the forefront of Nick’s mind when building in Dunsborough. This is where MgO SIPS come into their own. The outer walls are made from magnesium oxide and are fireproof, whilst the polystyrene core is fire retardant are self-extinguishes immediately. Houses made entirely or partially out of MgO SIPS are likely to drastically reduce any fire danger to the house should the threat present itself. Probably the most important aspect of these panels however comes in the form of their insulative and energy efficient properties. 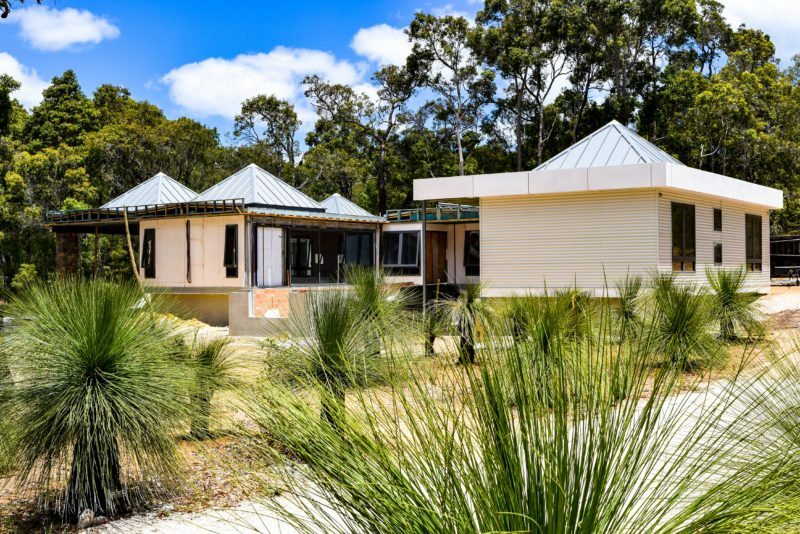 Nick Goode Construction has always strived for energy efficiency and building sustainable homes that tie in with the beautiful environment that the Dunsborough/Down South area has to offer. SIPS wall panels can give you up to an R5.5 rating and ceiling panels, with the addition of insulation bats, can give an incredible rating of R8. Put together, SIPS built homes will give you superior thermal properties all year round. 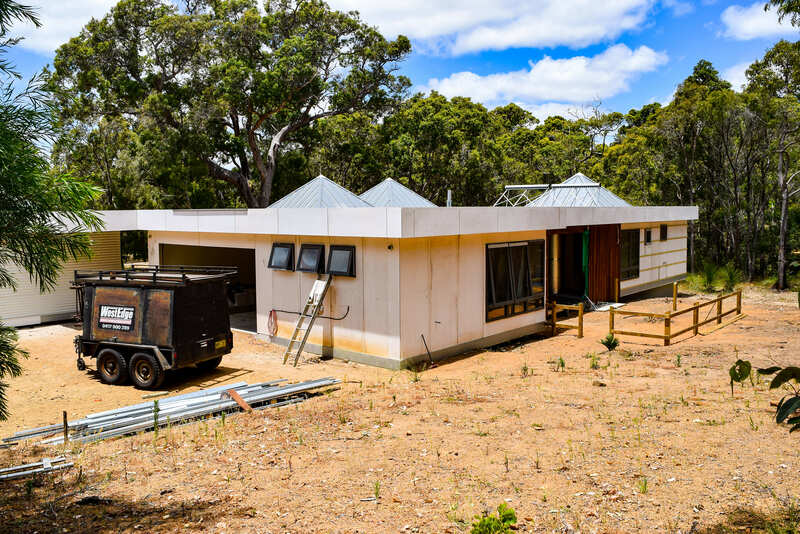 While a traditional timber frame house in Australia will leak up to 15.0 air changes per hour (You will be using your aircon and heater A LOT during summer and winter), SIPS leak as little as 0.25 airc changes per hour. Not only will you feel more comfortable but so will your wallet. This reduction is thanks to the way the panels lock together and are designed to fit tightly. You also have the added benefit of helping the environment and lowering your carbon footprint, which is not only socially responsible, but it gives you something to brag about to your friends.